This is a view from a high-rise building of the Diwali air pollution and contamination because of bursting of fire-crackers. It's worse than smog. A pity the noise pollution is not reflected here because as this photograph was being taken the sounds were deafening - over 100 decibels and this was from a high-rise Cannot imagine what it was like down there. I wonder how many people's ears, specially children's were damaged forever. Check this site which tells you what harm you have done to yourself. If a sound reaches 85 dB or stronger, it can cause permanent damage to your hearing. The amount of time you listen to a sound affects how much damage it will cause. Many crackers are around 120 DB and even a one-time exposure can cause permanant damage! If so much smoke can be seen you can imagine the number of chemicals being released in the air. And ofcourse the amount of noise. It's amazing that educated people are not aware that the noise will damage their children's ear-drums, not just theirs. As for the air pollution, asthma patients are holed up. And a lot more are being born. 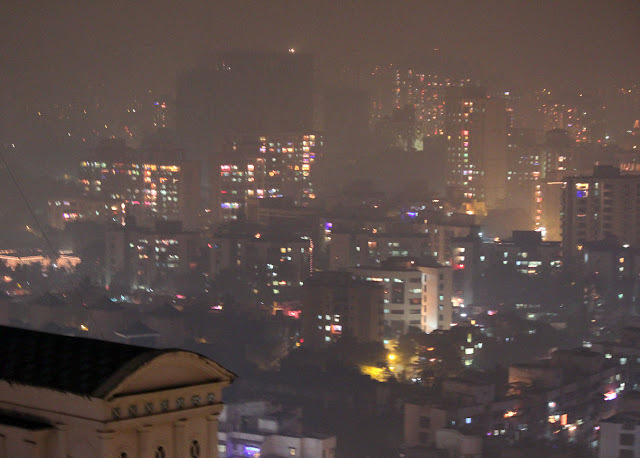 Every Diwali more and more people with respiratory problems surface. I do not think the Gods will forgive humanity for ruining the earth in their name. Yesterday was the most auspicious day of Diwali, and it was hard to see educated people make deafening noises and polluting the air with not just smoke but noxious chemicals. But ofcourse there will never be any laws on this. In this country lecherous and drunken behavior is allowed in religious processions. Noise and air pollution too is allowed in the name of religion. Let us hope that the next generation of Indians are better informed.